Posted October 7, 2011 by Alex Mullane & filed under Previews. Premiering just over a year ago on HBO, Boardwalk Empire quickly established itself as one of the most lavish productions on television. As if getting Hollywood cult favourite Steve Buscemi to star wasn’t enough, they also hired a certain Martin Scorcese to produce the show and even direct the pilot episode himself. And just to prove that they really weren’t messing around, they even built a 300ft long recreation of the actual Atlantic City boardwalk from the 1920s to the cost of around $5million. The opening episode in total came in at a tidy $18million, making it the most expensive pilot ever produced. Luckily for HBO, the show was a hit, and has swept up awards at pretty much every ceremony going. And so, given the lavish backing that the show itself was given, for the launch of Season 2, CultBox was invited to an equally lavish and expensive launch party. Having been summoned to do our civic duty (by Agent Van Alden, no less! 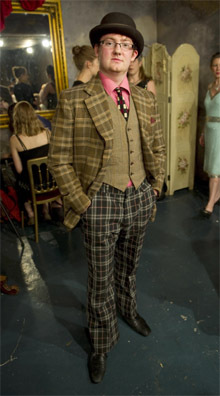 ), we were asked to infiltrate one of Nucky Thompson’s speakeasy parties, taking place at one of his new London venues. There would be alcohol present, and we were there to gather intel. Of course, one couldn’t simply walk into a 1920s speakeasy wearing a Kings of Leon t-shirt and a pair of Converse, so the team provided full costume for all the writers in attendance. The costumes were extremely authentic (and stiflingly hot, given the bizarre ‘Indian summer’), and the lengths with which the organisers went to recreate the decade didn’t stop there. Yes, rather like the show that inspired it, this party had incredibly high production values. 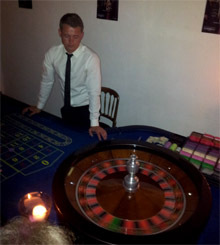 In fact, calling it a party cheapens the experience somewhat. This was time-travel; for one night, we were in the 1920s. Of course, the centre-piece of the evening was a screening of the first episode of Season 2, and given the setting, there couldn’t have been a better place to watch it. Thankfully, then, it didn’t disappoint. The episode begins with a startling moment of action, and seems to progress with a confidence in itself that the first year sometimes lacked. Michael K. Williams’ Chalky White has a beefier role, and Jack Huston’s Richard Harrow (by far the stand-out character and performer of Season 1) has been promoted to a series regular. Harrow is one of the most unique and engaging characters on television, and his scenes in the episode are so haunting and touching that they will break your heart asunder. It’s great to have the show back, and while this first ep certainly features a lot of recapping and reminders of who’s who and what’s what, it rattles along nicely, and with a surprising sense of humour – something that was definitely lacking last year. The production team have plenty of fun with the editing to create some great visual jokes, which indicates a confidence in their craft which flows out onto the screen. The show has a little way to go yet before it can quite match up to other modern HBO classics and spiritual ancestors The Sopranos and Deadwood, but this opener gives plenty of indication that it’s heading in the right direction. 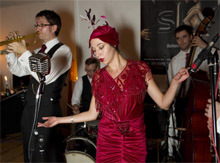 Meanwhile, back in our 2011 version of 1920, the party moves back downstairs, where everyone gets together to discuss the screening, while the band play another set and the burlesque dancer returns once again to set the pulses racing and the iPhone cameras flashing. Eventually the contraband booze gets the better of some, and the dancing begins. It’s startling to note how easily everyone slips into the character that their costume assigns them; mannerisms change and body-language alters. It’s hard not to swagger when dressed up like a ‘20s mobster! Eventually though, the time comes to return the costumes and return to the real world. Sky Atlantic, HBO, social media agency Spreading Jam and everyone else who had a hand in the event ought to be applauded for their effort and dedication to creating something truly, breathtakingly special in this launch. And the same can be said for all those who produce Boardwalk Empire itself. A fascinating, lavish series that presents us with a world that’s instantly recognisable as our own, yet still distant enough to feel alien, populated with some of the best characters on television. For just one night, we got to play at being one of them! Although given some of the dangers that face our heroes in the coming season, it’s probably for the best that it was just for the night.